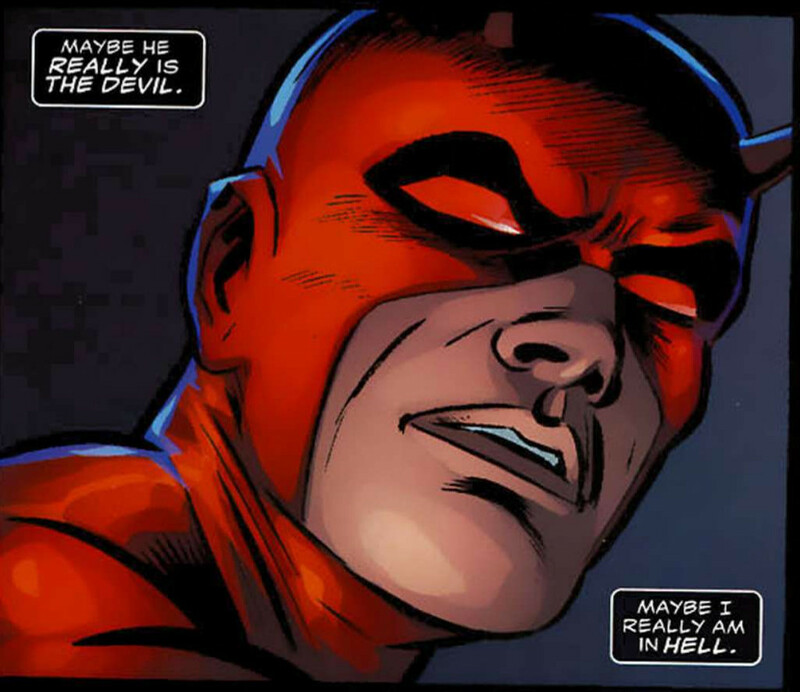 Daredevil is, imo, one of Marvels greatest heroes. There is a edge to him that stands out form the normal saccharin Marvel style which greatly appeals to me. I know that he was an original creation but as Miller took over in the late 70s he slowly became a Batman clone, which is a good thing; and besides Batman has enough juice to share around. Daredevil unlike many of the bat-a-likes is an distinguished and separate entity, one that is steeped in his own lore and personality to the point that all which remains to link him to Batman is a similarity in style and setting. Yet this link could be the core of why I love him so much. For me he is one of Marvels most "perfect" comic book characters. Punisher on the other hand is truly unique as far as I know and to my mind is not only one of Marvels greatest creations but one of the greats in all of comics. Forget Batman, Wolverine or Judge Dredd (to name but a few). There is only one King Kong bad mother fucker anti-hero in comics. The Punisher. The best of the best. I can not even, I mean where do I start. I could write pages of just gushing love for this character. We all know that the TV Show is coming and bringing the best that Marvel has to offer in the best comic book adaptation for the small screen ever made. So I thought I would dust off a comic from 10 years ago and see if it still had some of that magic. Love him, or more likely hate him, Garth Ennis was responsible for the return to form for The Punisher. His run started in 2000 and Punisher Max was in full swing topping sales charts around the world in 2004. So it is no surprise that The Punisher of this book takes many of it ques from the Punisher Max iteration, as it's a 2005 comic. While this book lacks the juvenile cruelty that is a characteristic of Ennis writing it dose retain the hopelessness of Punisher Max. This is the burnt out, hollow shell "deathwish isn't strong enough a word for it", Punisher. Punisher is a near perfect mirror for Daredevil. I mean there is a lot of talk about Superman and Batman at the moment what with the coming film, but the diametrical souls of the Daredevil and Punisher characters is such a better allegory then Superman and Batman ever have been. The best of intentions. The worst of intentions. The struggle of what is right vs the raw destructive finality of vengeance could not be better represented. The Punisher can represent his side of this coin in a way Batman never can, as Batman is not even a patch on the Punisher as a representation of insane, burning pragmatism. Just the fact that the Punisher kills, let alone all the other stuff going on with him makes Superman / Batman seam a trivial example of opposed ideologies. Then to top it off, one of the main themes of both characters is that all their efforts ultimately amount to nothing. 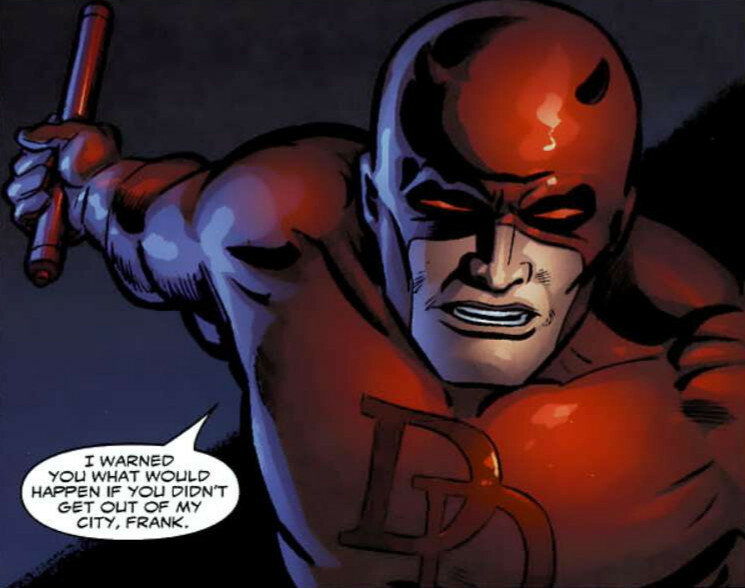 This is the key to Daredevil in my mind. Batman has this as well, and it is one of both characters most endearing traits. The hopeless struggle of light vs darkness, of order vs entropy. There is a stubbornness to Daredevil, an unshakeable belief that there "should" be justice, not that there "is" justice, but that there should be. Then there is Punisher. The darkest logical conclusion of what a superhero is at its core. A vigilante. A madman, beyond reason, beyond hope, where the criminals are but an excuse for a darker, more lost reason. Man I love Daredevil and Punisher. I should probably talk about the actual comic for a bit eh? The core of this book is a story about escalation. Beyond the Daredevil / Punisher smack down and the crime lords with the turf war that kicks it all off is the characters of a local business. A ordinary law abiding family who represent a touch stone of normalcy to put the rest of the book in perspective. It would have been all to easy to set this comic on what I call the "high hero" level. Where the actions of the main characters are only judged by other soups of the world. I liken it to the difference between a ww2 movie about soldiers and a movie about the peasants who live in the town the soldiers passed though. These characters bring the events of the comic down to earth and place it inside the readers experiences of family, loyalty and their perceptions of what justice is and should be. Creating a perfect control group to frame the story upon. One of the great aspects to this book is the way it is able to speak to some very adult themes with out the reader really noticing it until it is to late. As the story continues the war between Daredevil and Punisher becomes more important than the war against the criminals. As each character starts to see the other as a problem that can not be ignored. This leads the books to discuss some great ideas that are akin to the justice system itself. 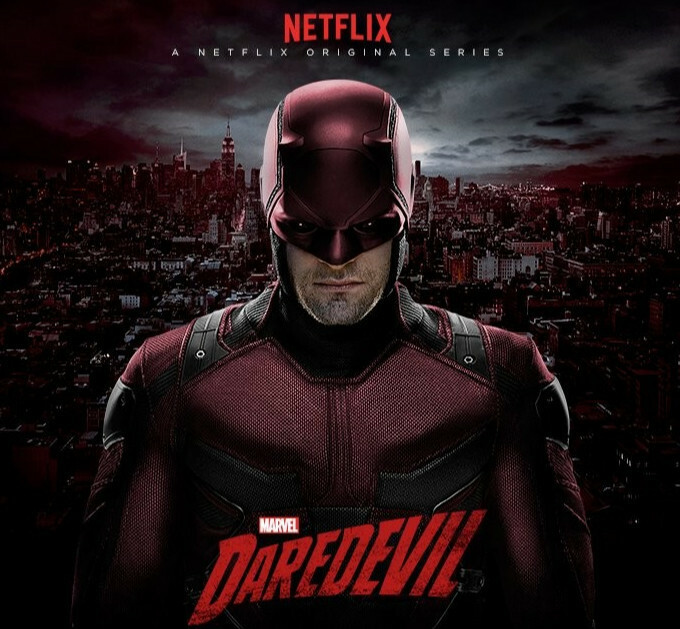 As Daredevil is forced into protecting the very people he hates, like the law has to. When should a known criminal be protected, how should his rights be considered vs his victims. Do victims care about what is right, or do they just want recompense? 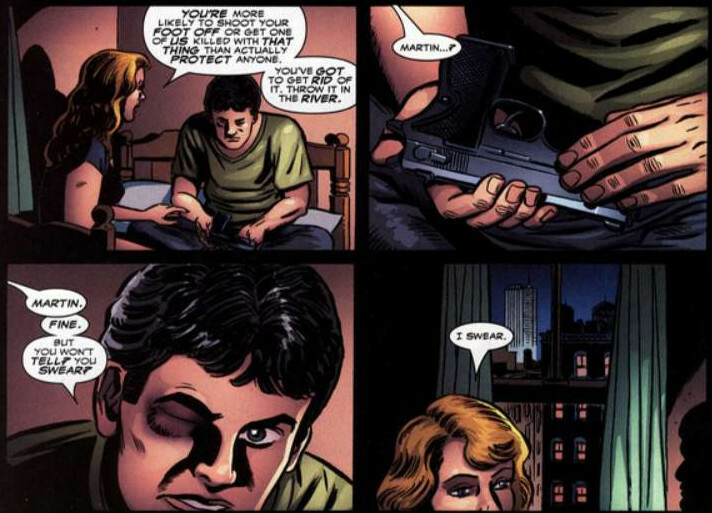 Daredevil becomes a metaphoric embodiment of the judicial system itself, while the Punisher becomes the voice of the victims, even the police in asking why is it that criminals are allowed to do so much and punished so little. It is a conversation everyone of you has had with your partners or your friends at one time or the other after reading the news paper. The news from any given day. All in all this is a fantastic book and one that anyone interested in this dynamic should read before the Netflix TV show comes out as I strongly suspect that aspects of this story will be in the show. If netflix can get even 1/2 of the concepts in this comic into the show it will be something to watch. Also this comic has one of those gloriously satisfying endings that I'm sure you will be chatting about years to come.